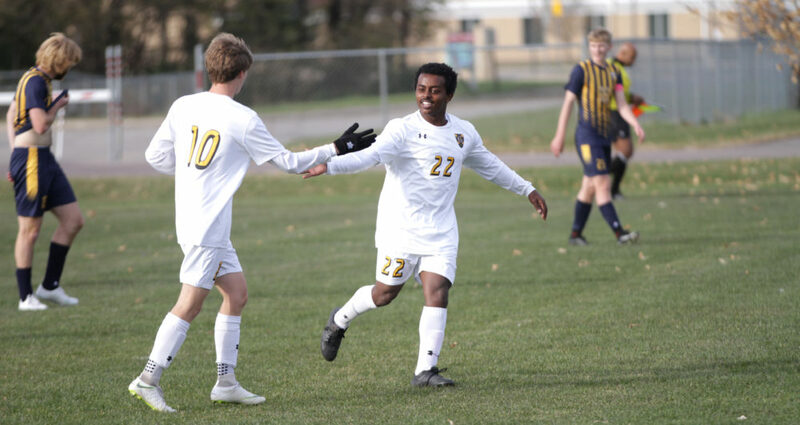 SAINT PETER, Minn. – The Gustavus men’s soccer team rebounded from yesterday’s tough loss with a decisive 7-1 victory over Buena Vista on Wednesday at the Gustie Reserve Field. The Gusties improve to 13-2-1 overall with just one match remaining in the regular season. Six different Gusties scored goals with six occurring in the first half. Arthur Parens (Sr., Wayzata, Minn.) started the scoring barrage in the eighth minute with his team-leading ninth goal of the season. Nolan Garvin (So., Batavia, Ill.) then scored what proved to be the game-winner in the 14th minute. Léon Equinet (Fy., Bonn, Germany) made the score 3-0 in the 21st minute. Six minutes later, Josh Anderson (So., Westmont, Ill.) tallied his first goal of the season. Scott Heinen (So., Aurora, Ill.) closed out the first half with a pair of goals to make the score 6-0 at halftime. The Beavers ended the shutout in the 54th minute before the Gusties tacked on the final goal of the day off the foot of Nicholas Summers (So., Marshalltown, Iowa) – his first of the season – in the 63rd minute. Matt Gibbons (So., Minneapolis, Minn.) recorded a hat trick of assists and continues to lead the MIAC with 24 points and now 10 assists. Gustavus outshot Buena Vista 31-4. Anders Severson (Sr., Woodbury, Minn.) and Matt Bateman (Sr., Savage, Minn.) split time in goal with Severson earning his 11th win after playing the first 45 minutes. Gustavus finishes the regular season 3:30 p.m. Saturday at Macalester with the winner claiming the MIAC championship. In the event of a tie, Gustavus owns the tiebreaker and would receive the No. 1 seed for conference playoffs.